Dr. David Spencer, a founding FIMS faculty member and a figure much beloved by his students and his colleagues, passed away on February 29, 2016 after a lengthy battle with cancer. David held a Ph.D. in History and Philosophy from the University of Toronto (Dissertation on Anglo-Canadian working class journalism), but his first career was that of a radio journalist. He graduated in 1962 from the Radio and TV Arts program at what was then Ryerson Polytechnical Institute, and spent the next decade as an Announcer, Producer, and Production Manager at CJAD-CJFM in Montreal and at CKFM in Toronto. After his work in radio, David spent 15 years as a faculty member in the Broadcast Program at Humber College. 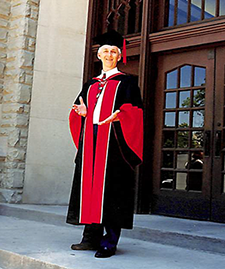 He took up his first appointment as a faculty member in the Graduate School of Journalism at The University of Western Ontario in 1987, and he later served there as Associate Dean and as Acting Dean. In subsequent years at FIMS, David taught in both the MIT and graduate MAJ programs, and was twice nominated for the prestigious Bank of Nova Scotia Teaching Award. He was promoted to Full Professor in 2002. As a scholar, David's preeminent passion was the history of print journalism in North America. He published scores of articles and reviews in the field, and was the author of The Yellow Journalism and the Rise of America as a World Power (2007); Transit Progress Derailed, Adam Beck and the Radical Railroad Controversy: A Study in Politics (2012); and Drawing Borders, A Cartoon History of Canadian/American Relations in the Gilded Age (2013). In the course of his career, David also served as the Head of the History Division of the Association for Education in Journalism and Mass Communications, and as the President of the American Journalism Historians Association. David was above all the kindest and most compassionate of colleagues. He was an outstanding mentor, and a legendary and often hilarious raconteur. He will be deeply missed by everyone at FIMS. 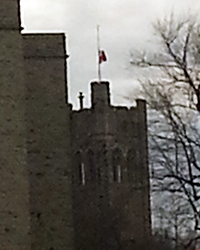 The flag on top of the University College tower was lowered all day on Wednesday, March 9, 2016, in memory of Dr. Spencer. He had 28 years of service at Western when he passed away on February 29, 2016. You can also view his obituary online.